Before alarms were installed in the College’s steam tunnels, students would use the tunnels to sneak around campus late at night. PHOTO COURTESY OF BOB WRIGHT. 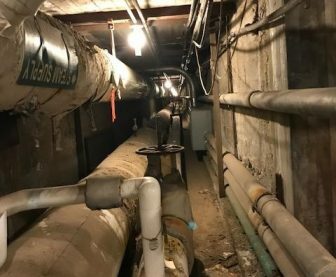 Beneath campus, stretching from Hopkins to Greylock, from Lasell to the President’s House, is a legendary network of tunnels. Constructed to connect the central heating plant’s utility lines to various buildings across campus, the tunnels have slowly expanded in both size and notoriety for the better part of a century. Dating back almost as long are efforts by students to take advantage of numerous entrances and exits around campus by “tunneling” from place to place after hours. It was unclear at first whether Boyer was serious. Such hair-raising details, often repeated rather facetiously by students hoping to add to the sense of mystery, are almost unbelievable. But this was only the first of several such stories that turned out, in the end, to be true, another addition to the lore of a not-so-secret tradition maintained across more than 70 years at the College. Rhett Austell ’48 lived in Morgan Hall – a prominent access point for students up until at least the ’90s – in the summer of 1943. Thinking back on the tunnels’ reputation among the student body at the time, he recalled that he “had heard about the tunnels, but never knew anyone who had walked through them.” Countless alums of more recent generations would echo that stance, reflecting a general awareness of the illegal activities but a reluctance to participate. In the ensuing decades, the tunnels appeared in two separate April Fools issues of the Record, with satirical articles from 1979 (“Alliance protests steam tunnel threat”) and 1981 (“Heating system goes nuclear”) capitalizing on the general sense of mystery the tunnels had acquired. Cart hardly has to imagine – his time in the tunnels eventually led him to make that very mistake. “One night, we reached a grate that was big enough to climb through, right above a well-lit hallway. The first two of us dropped down and pushed the grate open, and then we were standing there, brushing the dirt off and wondering where we were. Down at the end of the hall is the 24-hour security office in the basement of Hopkins. There’s a guy at the desk with his head down, because of course, it never occurs to him that there’s going to be kids popping out of the wall.” Incredibly, Cart escaped capture, but others in his position may not have been so lucky. One such outsider who received clearance was Ian Nesbitt ’13, whose exploits are documented in the Willipedia page on the steam tunnels and the Williams Magazine piece debunking some of the myths surrounding them. He completed OSHA training and entered the tunnels as part of his work in geosciences classes at the College.